The Shingle Plant is an herbaceous creeping vine in the Arum family, Araceae. 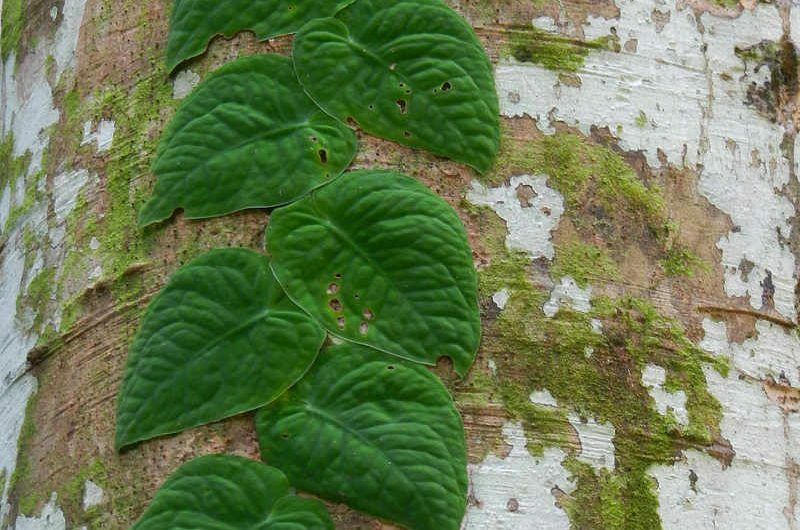 It gets its name from the “shingling” behavior exhibited by its young leaves, in which it lies flat against the surface of a tree. As it grows, it changes its leaf shape and growth habit. It starts to develop large, perforated leaves and no longer shingles. Mature leaves are dark green, broad and very large, up to 130 cm long and 75 cm wide, hence the name Monstera! Leaves often have natural holes in the blades. It uses aerial roots to climb trees and roots that grow into the soil to support the vine, and Monstera dubia can grow up to 20 m in height—it truly is a jungle monster! Its flowers grow on a special inflorescence called a spadix, characteristic of this family, which can grow up to 45 cm in length. Its fruit is a cluster of white berries. Keep an eye out for this ‘monstrous’ plant and its unique young shingles on your walks through the forests around the Canopy Family lodges.